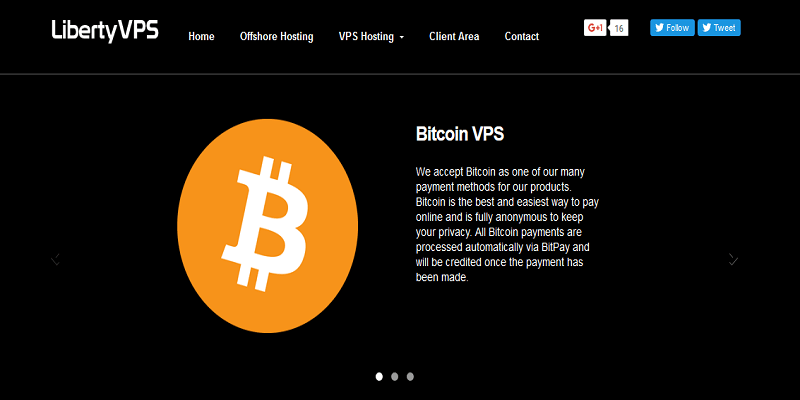 Home » Reviews » Liberty VPS Review: Best Bitcoin VPS Hosting? If you are looking for an offshore VPS hosting and want to have the flexibility of choosing between Windows and Linux platform, look no further than LibertyVPS. In this LibertyVPS review, we will talk about how this powerful hosting service provides you with anonymity as well as excellent privacy. To add to this, they also accept various cryptocurrencies as a payment option, including the very popular Bitcoin! Let’s jump in! LibertyVPS, as the name suggests, give you a lot of freedom and anonymity. You can remain 100% anonymous if need be which is also ensured by the fact they accept Bitcoin (or any other cryptocurrency for that matter) as a payment mode. So, you don’t have to worry about revealing your identity. LibertyVPS provides you with a 1 Gbps port speed which is awesome. Its LiteSpeed servers dramatically reduce the website load time, only drawback being the fact that you have certain limit on the monthly storage capacity front. If you are looking for a shared hosting service, you can get one easily through LibertyVPS. Let’s look at the key features and services offered by LibertyVPS. LibertyVPS have their data center located in Amsterdam, Netherlands which has state of the art infrastructure. This facility serves as a secure offsite location that guarantees best privacy and security. This offshore hosting is excellent for running websites, file servers, email servers, game servers etc. The reason LibertyVPS is a good choice for both beginners and experts is also due to the fact that their Linux servers have a variety of OS templates to choose from which makes your job easier. The problem with VPS is that most of the service providers tend to oversell their servers. This results in the end users experiencing very poor performance because the server resources and the bandwidth is shared between more number of users. With LibertyVPS, you don’t have to worry about this. The offshore Linux VPS uses KVM virtualization technology that ensures that you get the optimum performance for the money that you have invested. They do not oversell their servers and you have full control over your offshore VPS. It is as good as a dedicated server and you can run any application that you please like. Similar to the Linux VPS solution, the KVM virtualization technology ensure that you get the most out of your shared VPS service that acts like a dedicated server for you, allowing you to run the applications that you want with ease without encountering any performance impact whatsoever. Additionally, the windows servers also have a SolusVM control panel which creates a desktop environment and provides support for many desktop applications. Offshore windows VPS is recommended for beginners and experts alike who are not very familiar with the Linux environment. Final Thoughts: Should you invest in LibertyVPS Bitcoin Hosting? If you want the privacy and anonymity coupled with the option to host your website at a secure offshore location, then LibertyVPS is definitely a service you should invest in. Additionally, the freedom to choose your operating system, be it Linux or Windows provides you with good flexibility. LibertyVPS is therefore a must try for the aforementioned reasons. Do you have any thoughts to add to this? Do let us know in the comment section below.